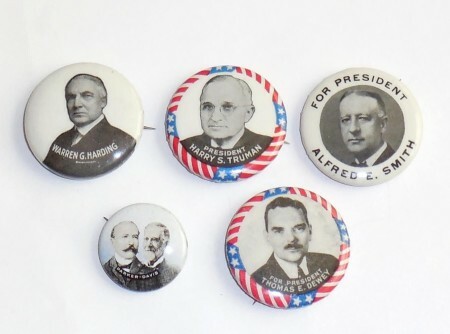 Group of 5 Political Pinback Buttons Harding Smith Truman Dewey. Please see our photos and product description for more information. 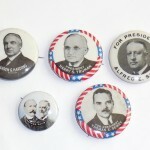 This is a group of 5 Political Pinback Buttons Harding Smith Truman Dewey. 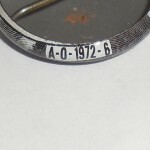 Only the smaller Parker Davis button is marked on the edge A-O-1972-6. The others are Warren Harding, Thomas Dewey, Alfred Smith, and Harry S. Truman. All 5 are in very good/excellent condition. 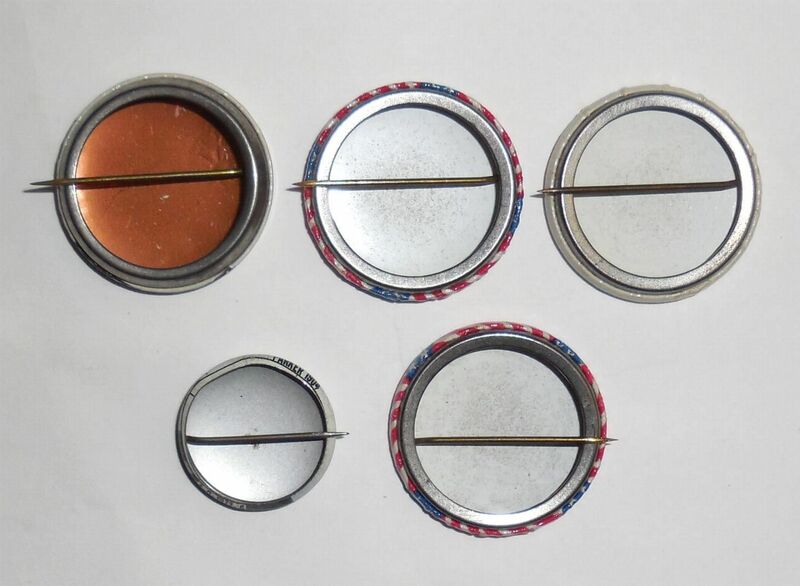 They are not rusted or scratched up or discolored. All have pretty clean backs. Parker Davis has a little mark on the back. All have nice, bright color. They came from as estate where they were put away and just left there since the 1970s. 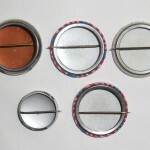 Sizes range from 1 1/4″ to just about 1″ in diameter on the smaller button. 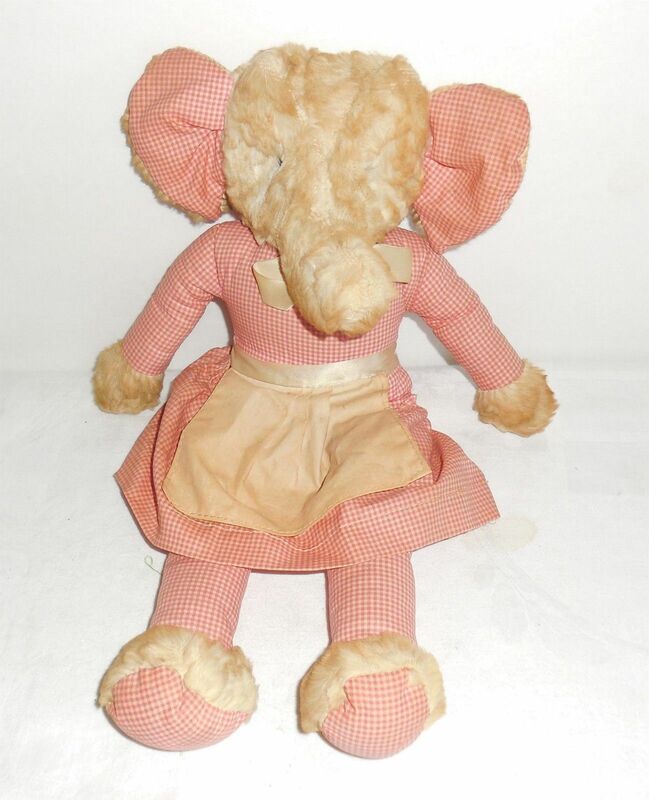 HTF Eden Red Gingham Stuffed Elephant Babar Tag Vintage Mid Century in excellent condition. Never played with and has original body, clothes, button eyes and hang tag but has some age dirt/ age color to the plush fur. Please see photos and read product description for more information. This is a lovely hard to find Red Gingham cloth body Babar Series vintage plush toy for your collection. These only pop up every once in a while on line!! 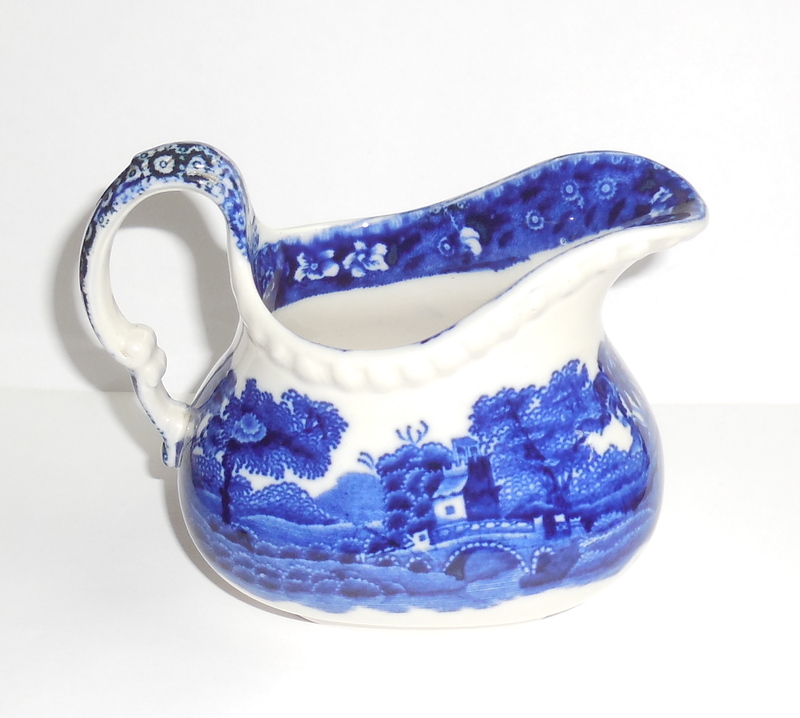 This is a lovely older vintage Copeland Spodes Tower Flow Blue creamer in the larger size and in excellent overall condition. 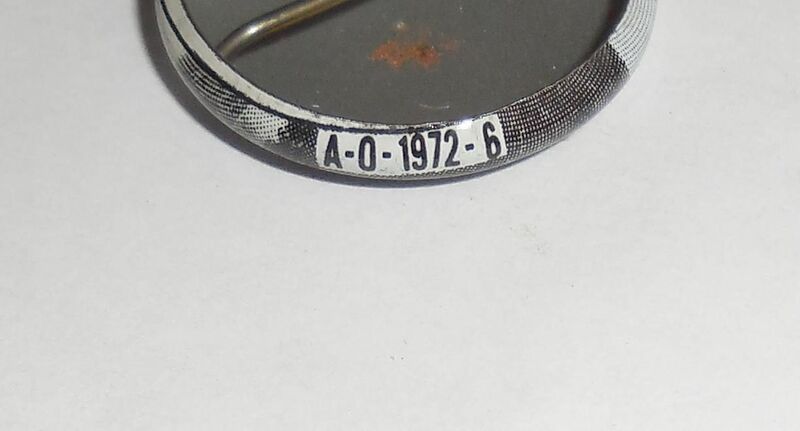 It has older vintage markings and beautiful deep flowing blue color. This particular type of Staffordshire English Porcelain/Pottery is exceptionally well made and quite desirable with collectors. Size is 4 1/2" across east to west from top edge of handle to tip of spout by 4" tall from top of handle to base north to south. Width across 2" front to back across the center. Being very bulbous in design the width across the body of course is larger. Overall condition is excellent. No cracks or chips.flakes or damage or repair. All original. Never altered. All good strong blue to cream white color. No Still crisp and clean. No discoloration. A lovely addition for your antique and vintage flow blue collection and for your formal dining table. Antique late Art Nouveau to Early Art Deco Figural Pepper Sliding Snuff Box. Handwrought Iron with Silver Tracery Pepper Flowers on Top. This is a slider. Does not lock. Never had a lock. Other than some age wear to the silver tracey it is in excellent condition. Slider works freely and easily. Size is 2" North to South from pepper stem to bottom of pepper. Width is 1 3/16" East to West across body of the pepper. Height is 5/8" tall. 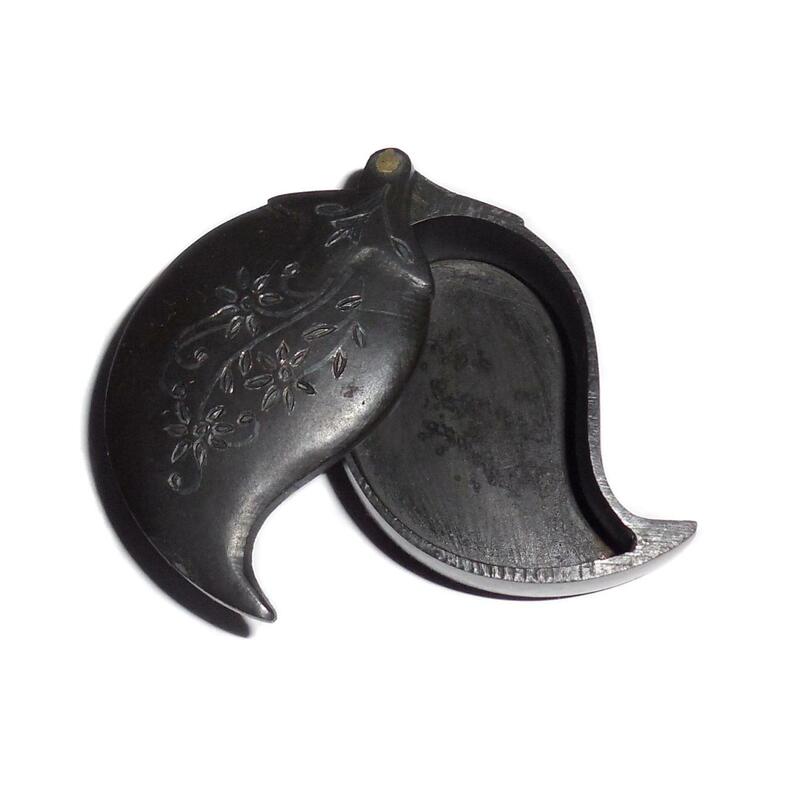 A lovely unusual antique figural snuff box originally for pepper snuff for your collection. 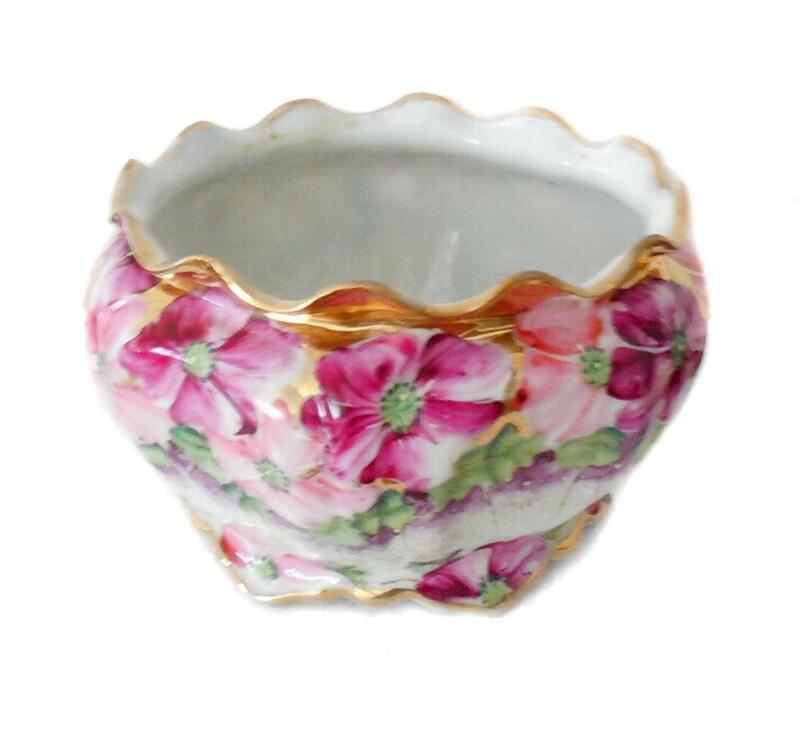 This is a vintage porcelain flower bowl with a good, thick, heavily glazed finish containing hand painted pink, rose, and purple colored flowers and gold trim.Very bright and colorful. Size is 3 1/2" tall north to south by 5 3/4" wide across the center east to west. It is very well made and beautifully decorated. Condition is excellent, very gently used. There are no cracks, chips, flakes, hairlines, or any other damage. Some minor age wear to the gold edging and some light brown spots underneath on the bottom. Never repaired or altered in any way. All original. No craze to the glaze. Ready to use for your favorite flowers or rose petals this is a lovely, vintage flower bowl for your entryway or formal table. Very, very pretty!